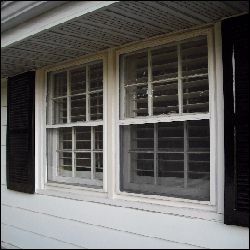 The older type of wooden storm windows are often ill fitting and ineffective in keeping the cold out. They are no longer mass produced. However, they are still available and often custom made for the older wooden sash style windows. Wooden storm windows can be made either as single or double glazed units. Traditionally they are hinged at the top and can be opened by pushing the bottom outward. Storm windows. Wooden storm windows. Window condensation problems. - Rigid acrylic. It is magnetically sealed and fastened to the window frame. - Flexible plastic, which is attached with double sided tape and heat shrunk into place. Window condensation on older single glazed windows with storms is a common problem. It is caused by several factors, including the temperature of the window surface and surrounding air, and the relative humidity of the air. Condensation on the exterior window pane or storm is a sure indication that warm moist house air is escaping past leaky interior panes. Controlling the air leakage (see above) may solve this problem. Condensation on the interior window pane is a sign of high humidity levels. Window surfaces should be kept warm by good heat distribution and air circulation. Don't block heat registers with furniture, carpets or heat deflectors.